PreferredStockInvesting.com Great Resources for Preferred Stock Investors! - from Gary L, CDx3 Notification Service subscriber, November 27, 2015. See more preferred stock investor reviews here. See page 1 of this month's issue of the subscriber's newsletter, CDx3 Research Notes, for symbols. 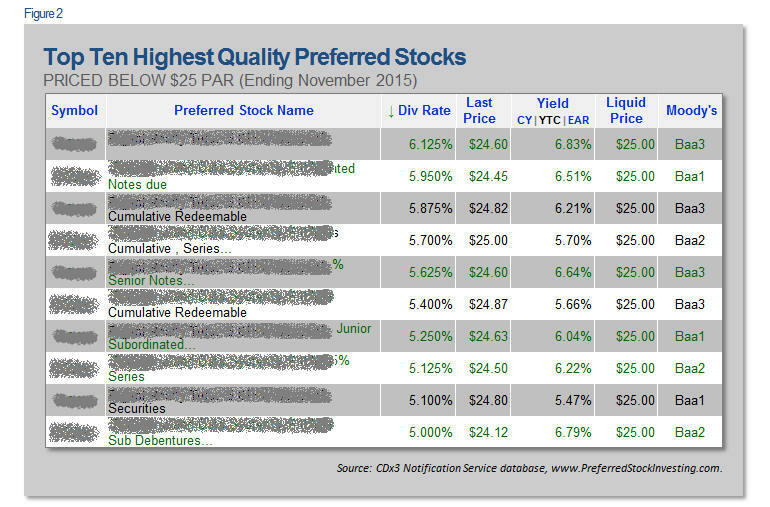 The ten highest quality preferred stocks that are selling for a sub-$25 market price are offering income investors an average 6.2 percent Yield-To-Call in today's preferred stock marketplace. As rates move up and down over time, prices tend to move in the opposite direction, moving down and up, respectively. This is why preferred stock investing is long-term investing, taking advantage of the known inverse relationship between rates and prices over time. 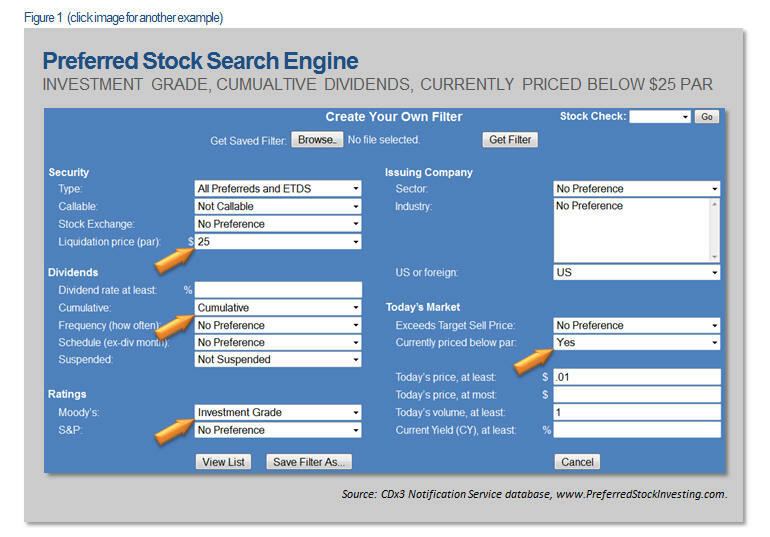 The search engine parameters seen in Figure 1 look for preferred stocks and exchange-traded debt securities (ETDs) that are currently trading below their $25 par value, have cumulative dividends (meaning that if the issuing company skips a dividend payment to you, they still owe you the money) and offer investment grade ratings from Moody's Investors Service. Purchasing shares below $25 is an important consideration for many preferred stock investors. In the event that your shares are redeemed (bought back from you) by the issuing company, shareholders will receive the security's par value in cash in exchange for their shares. By purchasing shares below their par value ($25 in most cases and in all of the cases shown here), preferred stock investors are able to add a layer of principal protection to their investment while also positioning themselves for a downstream capital gain in the event of a future call. Figure 1 shows the complete filter used to find these gems. Of the twenty parameters that can be set, the four arrows highlight the keys for this search. Setting the "Currently priced below par" parameter to "Yes" does the magic here. In addition to finding the highest quality issues that offer cumulative dividends and are currently trading below their $25 par value, this filter also limits the list to issues that have not suspended their dividend payments. And by setting "Today's price, at least" to $0.01 and "Today's volume, at least" to 1 share the filter will exclude less liquid issues (securities that have not traded today). This is just one example. Click on the filter image to see another one along with a more detailed explanation. 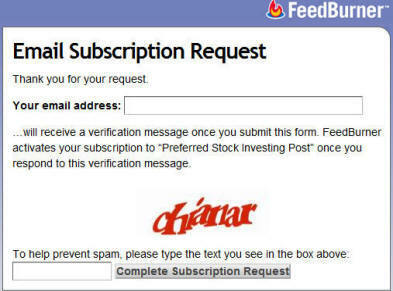 Figure 2 shows the results when this search is applied to our Preferred Stock ListTM database (please note that to protect the values of subscriptions to our CDx3 Notification Service, trading symbols are obscured here). Already a CDx3 Notification Service subscriber? See page 1 of this month's issue of the subscriber's newsletter, CDx3 Research Notes, that you received at the end of last month for symbols. There were a total of 888 preferred stocks and ETDs trading on U.S. stock exchanges as last month came to a close. Of these 888, these are the top ten highest quality issues that are trading below their $25 par value. This list is sorted by dividend rate (coupon) with the highest payers listed first. The securities shown in green font are ETDs (ETDs are bonds that trade on the stock exchange rather than the bond market and are very similar to preferred socks) while the remaining securities listed are preferred stocks. All have a current market price (seen in the Last Price column) that is below their $25 par value (as shown in the Liquid Price column) and enjoy an investment grade rating from Moody's. Keep an eye out for sub-$25 buying opportunities such as those listed here. The lower your purchase price, the more principal protection you'll have. The preferred stocks and ETDs listed in Figure 2 are offering some of the best choices available to you as an income investor. Most preferred stocks pay dividends each quarter. And whoever owns the shares on the security’s ex-dividend date is going to receive the entire quarter’s worth of dividend income, regardless of how many days during the quarter you actually owned the shares. Obviously, knowing which preferreds are about to reach their next ex-dividend date becomes important to buyers looking for a quick dividend. While most preferred stocks pay dividends on a quarterly schedule, the schedule varies; some pay in January, April, July and October while others pay in February, May, August and November. But most (56%) pay their dividends using the calendar quarter - March, June, September and December. 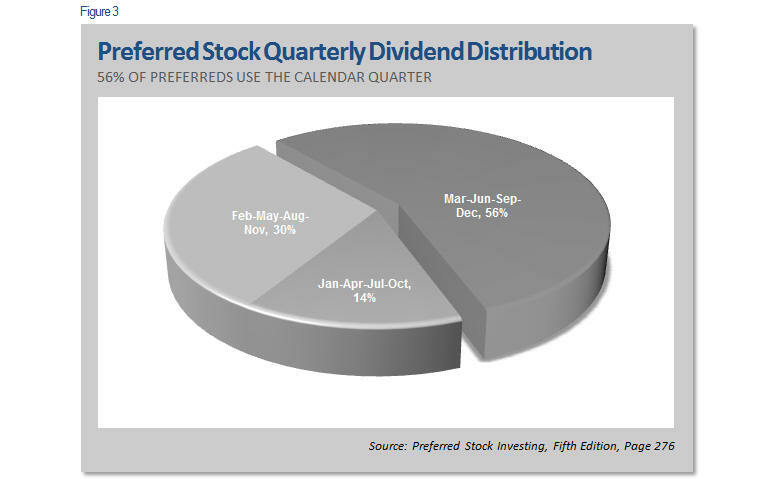 This chart shows the current dividend distribution used by U.S.-traded quarterly payers. Since the payment schedule of quarterly payers varies, a robust preferred stock portfolio generates income every month. There are currently 888 preferred stocks and Exchange-Traded Debt Securities trading on U.S. stock exchanges. ETDS are very similar to, and are often listed as, preferred stocks but are actually bonds that trade on the stock exchange (rather than the bond market). Before the availability of online preferred stock databases and search engines, finding out which ones were (a) of high quality and (b) about to reach their ex-dividend date took so long that the opportunity would come and go before the specific candidates could be nailed down. Fortunately for today’s preferred stock investors, that is no longer the case. Using an online database and preferred stock search engine (the CDx3 Notification Service database is used here), finding high quality issues that are within days of providing their shareholders with 90 days’ worth of dividend income now takes just a few seconds. High quality is defined here as those securities having an investment grade rating from Moody’s, cumulative dividends (meaning that if the issuing company missed a dividend payment they have to make it up to you; their obligation accumulates) and are currently call-protected. I also limited this list to those securities that are trading within one quarter’s worth of dividend income of these securities’ $25 par value (i.e. up to $25.50), the thinking being that paying slightly above par may be acceptable since today’s buyers will receive a full quarter’s worth of dividend income after having owned the shares for only a few days. Here are the twelve U.S.-traded high quality preferred stocks and ETDS (shown in green font) that have (or are expected to have) an ex-dividend date during December 2015. Those who own shares of any of these twelve securities on the indicated ex-dividend date will receive the upcoming quarterly dividend payment from the issuing company. ($25 times [dividend rate]) divided by 4. The [dividend rate] value is the percentage that you see in the “Div Rate” column in the above table. For example, DLR-G is issued by Digital Realty Trust, Inc. (DLR) and pays a 5.875 percent annual dividend. The dividend that preferred stock shareholders receive is always based on the security’s “par” value, not your purchase price and not the current market price. The par value for each of the twelve securities shown above is $25 per share so DLR-G pays an annual dividend of $1.47 per share ($25 times 5.875 percent). Dividing this annual amount by four gives us the quarterly dividend payment of $0.37 per share to those holding shares when the market opens on the morning of DLR-E’s December 11, 2015 ex-dividend date. 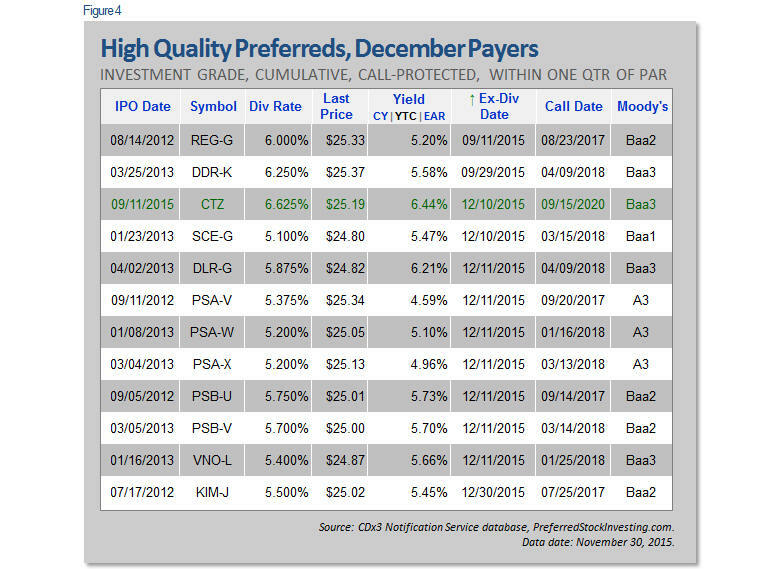 These twelve “high quality” December payers not only have several risk-lowering characteristics that are pretty easy to warm up to, but are also from a diverse array of companies and industry segments. Ten of the eleven preferred stocks (black font) listed in the table are issued by seven REITs - DDR Corporation (DDR), Kimco Realty (KIM), Regency Centers (REG), and Vornado Realty (VNO), retail centers; Digital Realty (DLR), data centers; Public Storage (PSA), self-storage and PS Business Parks (PSB), office buildings. SCE-G is issued by Edison International’s Southern California Edison (EIX), a $19 billion utility. The remaining security, CTZ, is an ETDS (green font) from Qwest Corporation, which is CenturyLink’s (CTL) cable-laying subsidiary. I have set the Yield column in the above table to show Yield-To-Call since these twelve securities are currently call-protected. The YTC calculation assumes that you reinvest your dividends and also accounts for any capital gain or loss you realize when the shares are redeemed, on the indicated call date, by the issuing company (in that event, you receive the security’s $25 par value in cash in exchange for your shares). But remember that preferred stocks with coupon rates below six percent are rarely called by their issuer so many of these securities may represent long-term holdings for today’s buyers. Also, note that preferred stock market prices tend to rise as their ex-dividend date approaches so better prices may become available for these issues after the indicated ex-dividend date (but you will miss the upcoming dividend). If the characteristics of these securities are consistent with your goals, resources and risk tolerance, you can make 90 days’ worth of dividend income after having invested for only a few days during December. Just remember that you must own the shares prior to the security’s December ex-dividend date and you’ll be in the chips going into the new year. Preferred Stock Investing is one of the highest reader-rated books in the United States with 89 reviews posted at Amazon. The Fifth Edition addresses selecting, buying and selling the highest quality preferred stocks during the market conditions that we are currently facing. - Part I, "The Preferred Stock Market," introduces a new suite of charts and metrics specifically designed to measure and track the preferred stock marketplace. - Part III, "Buying the Highest Quality Preferred Stocks," includes several new chapters such as "Buying 'Fed-Free' Preferred Stocks," "Keeping Up with Increasing Interest Rates" and "Buying Less-Than-Perfect Preferred Stocks." - And chapter 8, "Managing the Risks," has been completely rewritten and expanded to include risks that are unique to preferred stocks during the increasing rate environment that awaits us. You can pick up a copy of the new Fifth Edition of Preferred Stock Investing at your favorite online retailer such as Amazon (paperback) or directly from BookLocker, the book's publisher (BookLocker provides paperback and PDF eBook formats). Here is a list of some of my recent syndicated articles. To view an article, just click on the headline. 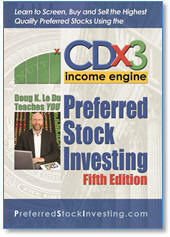 Readers do not have to wait until next month's issue of the CDx3 Newsletter to stay plugged into the market for high quality preferred stocks. Preferred stock research articles, marketplace observations and preferred stock news from the financial press and other information are posted to the Preferred Stock Investing Reader's Forum (my "blog") throughout the month. (c) 2015 Del Mar Research, LLC. All rights reserved. The content of this newsletter, and the materials that it links to that are owned by Del Mar Research, LLC, are to be regarded as educational, rather than advisory. There can always be exceptions to trends and/or generalizations that may be presented herein. Consider your financial resources and goals before investing. You, and not Del Mar Research, LLC, are solely responsible for your own investing decisions.